This is a new printing on sturdy acid-free paper. The subtitle of this piece is “A reminiscence of an evening service interrupted by a Storm.” It was written and performed by the organist of the historic Sherborne Abbey, founded in AD 705. 8 pages. All markings are original. Highest quality guaranteed. Size of music is 13.5" x 10.5". $12.00. George Edwin Lyle was born in Sheffield, Yorkshire, England in 1842. 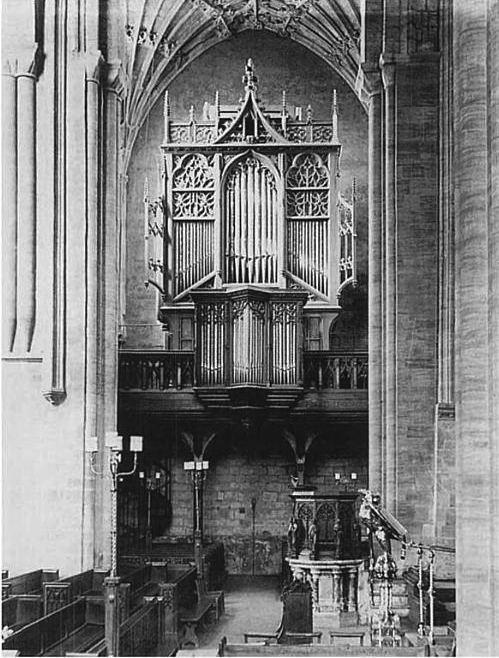 He was organist of Mold Parish Church, Wales, and, from 1873 to 1900, at Sherborne Abbey. He played the III/41 Gray & Davison (1856), seen at right, that had been built for the 1851 Great Exhibition for the Crystal Palace. He was also conductor of the Abbey Choral Society and the Sherborne Philharmonic Society. His compositions include cantatas, anthems, and piano and organ pieces. He died on January 3, 1900, in Sherborne, Dorset, England. The Abbey Chimes was composed after the tradition of storm pieces that were improvised. Lyle places his version within the context of a church service. After beginning with extended change ringing emulating that done on the eight bells at Sherborne Abbey, a voluntary is heard. Later, during the hymn, thunder rumbles lead to the fury of the storm. The service continues with the Psalm chant as the storm proceeds. During the ending hymn, Tallis Canon, the storm recedes into the distance and the service is ended. The introductory Voluntary and the final March will be found useful as separate pieces. Moderate.